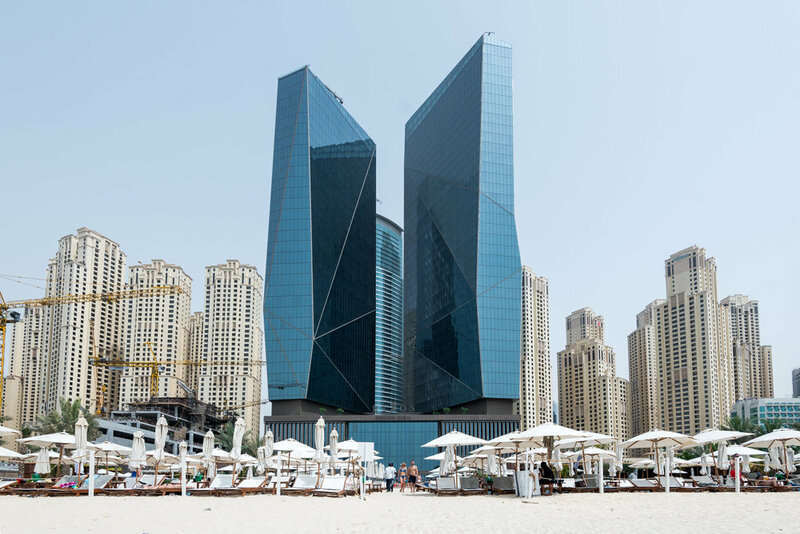 Located on Dubai's famed Jumeriah Beach, the Rixos Premium Dubai, offer hotel guests a party atmosphere amid the skyscrapers of the Dubai Marina. 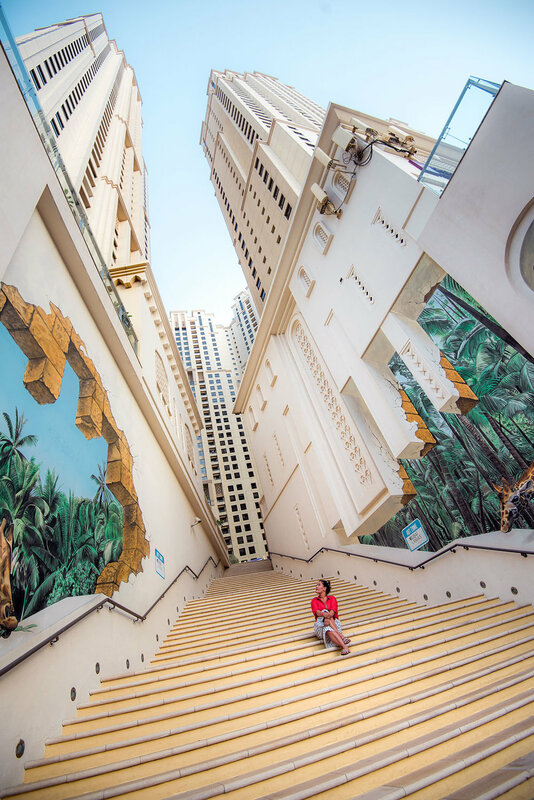 While it might be located in the heart of the Middle East – a region reputed to have relatively conservative attitudes, Dubai is place where visitors can let loose and enjoy themselves. As part of its drive to embrace the Western world (and the world at large) it has turned itself into a modern, dynamic city, and this holds true when it comes to having fun. 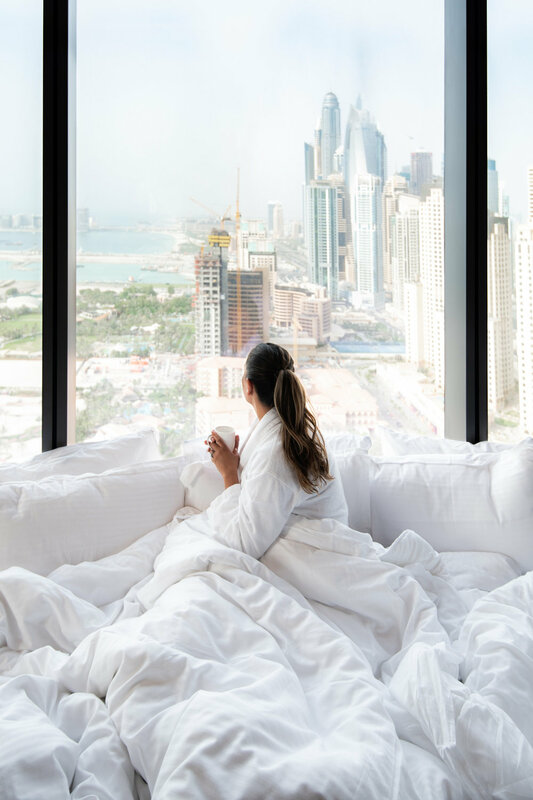 If you know where to look, you can party as hard here as you can in London, Paris, or Las Vegas and the Rixos Premium Dubai is one of the places those in the know look to when coming to Dubai. To start, the Rixos Premium Dubai is located right on Jumeirah Beach, with the Dubai Marina just outside its front door. We could walk out onto the sand to relax by going through one door, and straight into the bustle of the marina’s shopping center by walking out the other. This is one of the most exciting parts of town, and after the worst of the sun’s rays have passed, it is packed with people strolling around, perusing its designer shops and socializing in its many restaurants. The whole scene is reminiscent of Beverly Hills or parts of my hometown, San Diego. The shopping, dining and drinking options are not confined to the outside of the hotel either. It’s lower floors have all sorts of businesses, conference rooms and even a nightclub. Needless to say, the clientele that Rixos attracts are largely trendsetters and party-goers. The architecture of the hotel is sleek and modern, comprising of two glass towers which look like cut crystal. It wouldn’t look out of place in Las Vegas, but nowhere in Vegas can boast a beach – let alone one this nice. Inside it is equally impressive; The lobby is enormous, and every surface from the floor to the ceiling reflects the light coming in through the three story windows like a mirror. 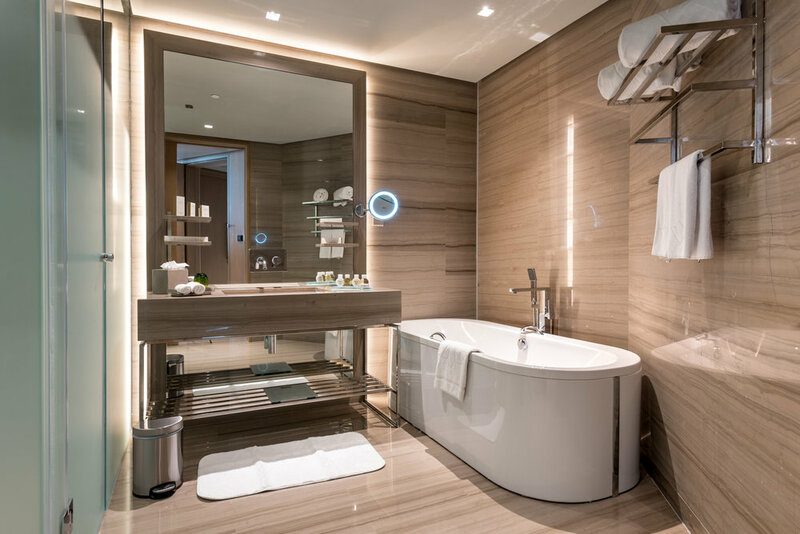 There are an array of rooms and suites to choose from, and we went all out with one of the premium two bedroom suites. Having done it, we now won’t be able to stay in anything less on a return visit -- it was incredible! We only used one of the two bedrooms, but next time we know that it gives us enough space for accompanying family, friends or even a nanny to look after Axel. The crowning feature was the almost 360 degree view. Spread out below us was the Arabian Gulf, Jumeirah Beach, the skyscrapers of the city and even the Dubai Eye -- the world’s largest ferris wheel. On a clear day we could even glimpse the Burj al Arab in the distance, but no matter what the weather was like we found ourselves spending literal hours staring through the windows and taking it all in. The whole lounge room was built around the glass wall which provided the view, with the tasteful and modern furniture being arranged so that it was always within sight. 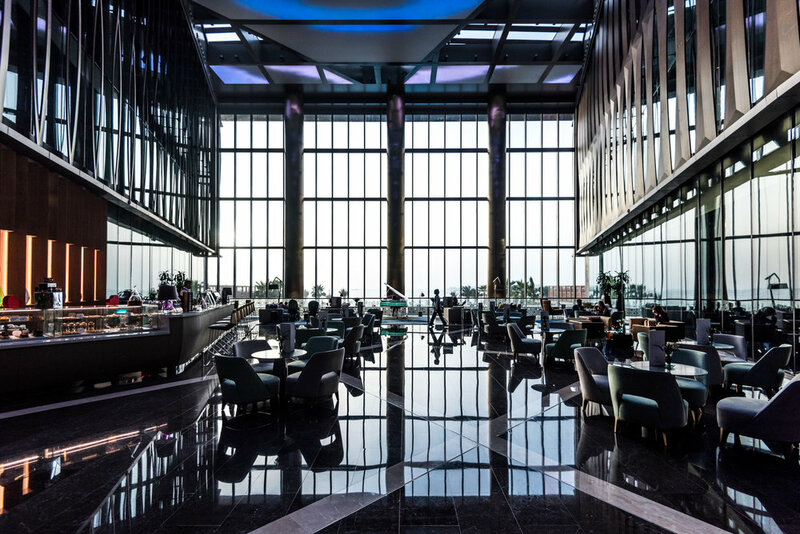 With six different restaurants and three bars, there are plenty of dining options at Rixos Premium Dubai. You can eat American-diner style food, traditional Italian dishes or Mediterranean cuisine. The hotel’s most famous restaurant; Turquoise, however is Turkish (well mainly), and this was were we ate most of our meals, starting each morning with their breakfast buffet. For lunch their menu includes things like hummus (of various types), fresh vegetables, grilled fish and sandwiches. Dinner is where they really excel though. Usually, they put on a buffet that fits one of their themes, but they do it without any of the tackiness that these sorts of things often suffer from. In fact, it is so popular that even hotel guests have to make reservations as the locals consider it one of the best dinners in town. We had the pleasure of experiencing two of these, one dinner and one brunch. Their Istanbul night (as you might guess) is designed to give you a taste of Turkey. They have everything that makes Turkish food so good, including baklava, cilbir, baba ganoush and lots and lots of raki. Alongside the Anatolian food, there are DJs playing Turkish music, live bands and even belly dancers. The other event we caught was the Na Zdorovie Russian Brunch. 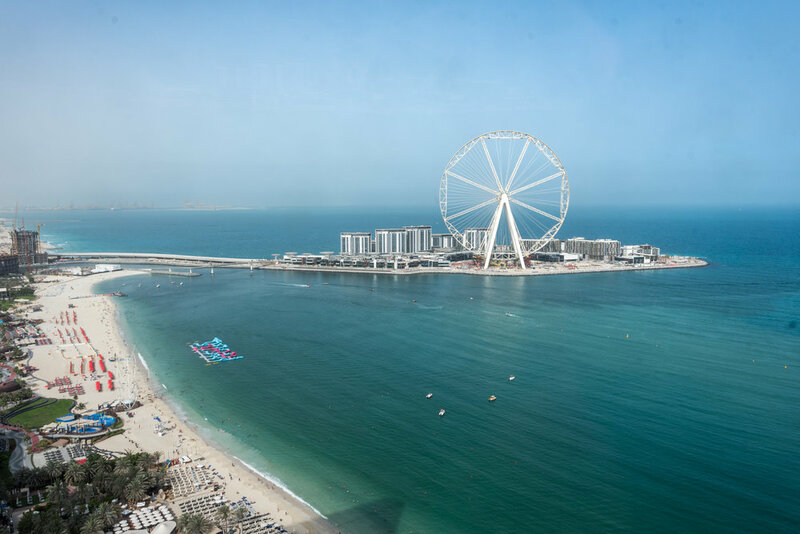 While at first glance the cold steppes of Russia might seem far away and out of place in Dubai, it actually fit perfectly with the high-rolling atmosphere of the hotel. The brunch included delicacies like caviar, Borscht and Blinis, accompanied by seafood and washed down with champagne. You are served by staff dressed in traditional clothing, and if you can stomach it so early in the day there is an unlimited supply of Russian Vodka. 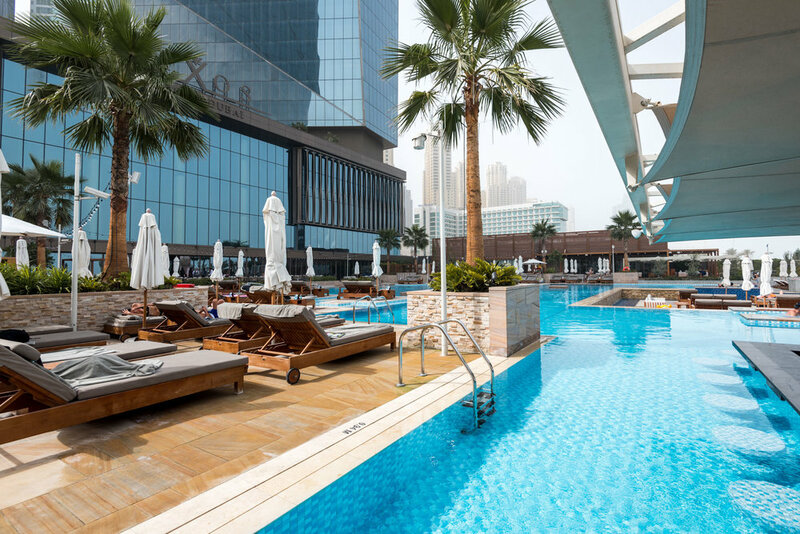 The most popular amenities at Rixos Premium Dubai are without a doubt the beach and the pool. If you have ever been to a Las Vegas pool party you will have an idea of the atmosphere you can expect to find at Rixos Premium Dubai. There are posh cabanas for lounging, populated by beautiful fashionistas sipping champagne and cocktails, while a DJ plays downbeat music and palm trees sway overhead. The glamour is palpable. If you want something a little more low key, stroll across the lawn to the beach, grab a lounge chair and let the day melt away. There is also a spa, gym and a travel agency offering water sports on site. It was great to experience this area of Dubai’s, and if you like an upmarket party then you will love this place. That said, Rixos Premium felt like a completely suitable place to stay with our four month old son in tow. Thanks to its wide selection of restaurants, its pool, beach and shops, there is a little something for everyone here and much of the best that the city can offer is right on its doorstep.